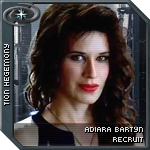 Adiara Bartyn is the last remaining member of a once repected family from Taris, House Bartyn. Written by Adiara Bartyn, 7 years ago. Last updated on Year 13, Day 286, 14:26:40.